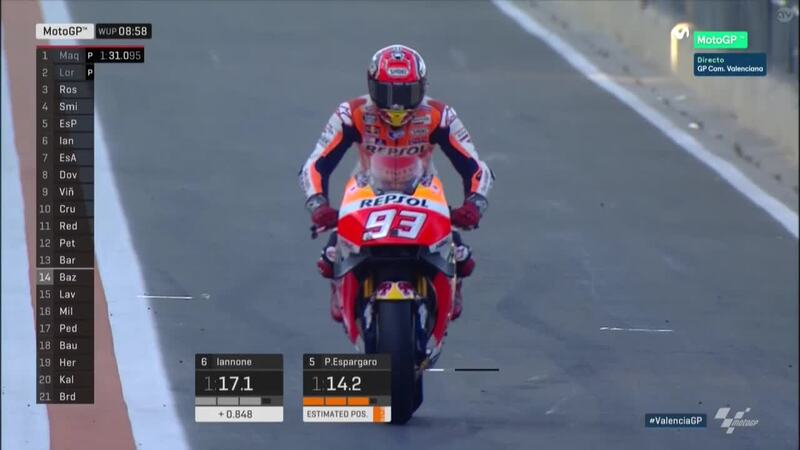 Marc Marquez (Repsol Honda Team) was quickest as action opened on the final Sunday of the year, from Team Suzuki Ecstar’s Maverick Viñales and Ducati Team’s winner last time out Andrea Dovizioso. Pol Espargaro (Monster Yamaha Tech 3) was top Independent Team rider in fourth, ahead of Andrea Iannone (Ducati Team) and Valentino Rossi (Movistar Yamaha MotoGP) – followed by teammate and pole setter Jorge Lorenzo. Aleix Espargaro (Team Suzuki Ecstar), Bradley Smith (Monster Yamaha Tech 3) and Cal Crutchlow (LCR Honda) completed the top ten, with Dani Pedrosa (Repsol Honda Team) returning from injury just behind in P11.